Unfamiliar with the meaning of those words, I asked the locals to give me the scoop on what the building was used for. They introduced me to the interesting and tradition-rich game of jai alai (pronounced Hi-Lie). Often called the “fastest sport in the world,” jai alai consists of men with weird basket hands whipping rock-hard balls against a granite wall, trying to make their opponent miss the return while avoiding being hit with the speeding bullet themselves. It’s a game that requires a combination of skill, speed, and acrobatics. If you’re not familiar with the sport, here’s your primer on the intense and manly world of jai alai. Jai alai originated as a handball game in the Basque area of Spain’s Pyrenees Mountains over four centuries ago. Games were played on Sundays and holidays in small villages at the local church, hence the name jai alai which means “merry festival” in Basque. 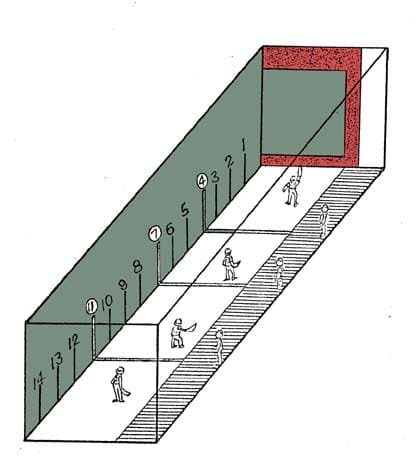 Players would use the open-air church courtyard and the walls of the church as the fronton or arena. 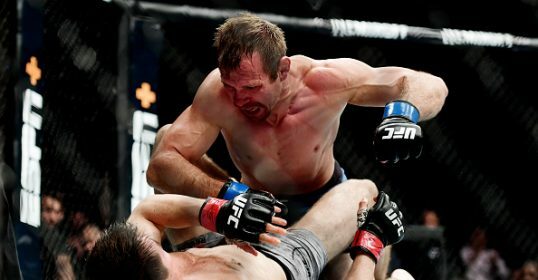 The tie between the church and the sport even earned the game a patron saint-Saint Ignatius Loyola, who took part in the sport when he wasn’t busy founding the Jesuit order. The players started to put leather on their hands to protect them from the hard ball that they used in the games and moved to indoor frontons near the end of the 18th century. Around the late 1800’s a Basque farmer got the idea that if they put a cesta, or basket, on their hands, they could hurl the ball a lot faster and a lot harder. 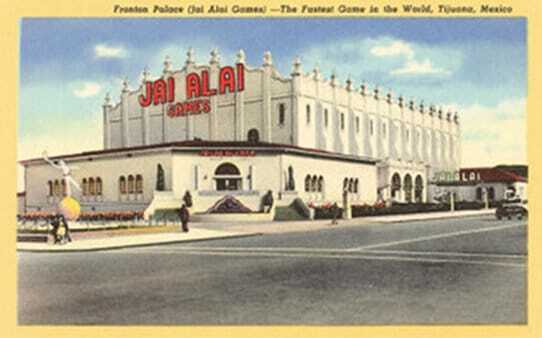 Vintage postcard Tijuana’s Jai Alai palace. The game spread to and gained popularity in Spanish speaking countries like Mexico and Cuba, and even the Phillipines. Americans got their first taste of jai alai at the 1904 St. Louis World’s Fair. After its initial introduction in the U.S., frontons started going up all over the country. 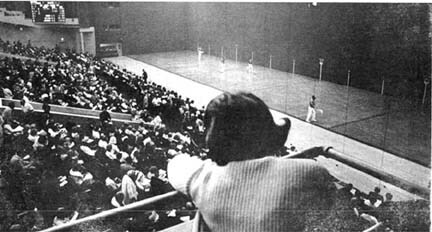 Spectators flocked to jai alai arenas to watch the “ballet with bullets,” and it quickly became an alternative to horse and dog racing for parimutuel gambling. Sadly, jai alai waned in popularity during the 1980s. Many of the jai alai frontons in the United States closed. However, the game remains popular in Florida where six frontons still attract old spectators and gamblers wearing their straw hats and guyaberas and drinking cheap beer. While 2/3 of the players in America still hail from the Basque country where they are started in the sport from a very young age, a few Americans have proven their prowess on the court as well. In the past few years, jai alai has gained more attention and is making a small comeback. Perhaps the Dos Equis commercials where the Most Interesting Man in the World makes a spectacular jai alai play is responsible! St. Petersburg, FL recently opened a jai alai facility to train new players. Plans exist to open frontons in Dallas, TX and Hartford, CT. Will we see more jai alai frontons open up across the country and fans flocking to them to bet on the fastest game in the world? Maybe so. Horse races are fun, but watching a ball being hurled at 170 mph and men diving to the ground and running up the wall to get said ball has an appeal all of its own. In case you decide to check out the fastest game in the world, here’s a brief rundown on how the game is played. The basics are easy to learn and the finer rules and points of the game can quickly be picked up after watching a few matches. The uniform. Players wear sneakers, t-shirts with their post number on the front and their unique number on the back, white pants, and a red sash around their waist called the faja. Since 1968, when a professional player was put in a coma for 6 months after getting hit in the head with the ball, players have also been required to don helmets. The pelota. The jai alai ball is the fastest, hardest ball in sports. It has been clocked at speeds up to 188 miles per hour and is as hard as a rock. The ball is about ¾ the size of a baseball and is constructed of hand wound Brazilian rubber which is wrapped in thread and covered by two hardened goat skin covers. Each ball is made by hand and costs about $100. The cover must be replaced every 15 minutes of play because it splits after hitting the fronton wall at high velocities. Because of the pelota’s hardness and velocity, jai alai is an extremely dangerous sport that has killed several players. The cesta. Cestas are made of reeds found in the Pyrenees Mountains and are custom made for each jai alai player. The hand is inserted into a leather glove and held in place by a wrap-around tie called a cinta. Cestas are hand woven and it takes over 14 hours of labor to make just one. They’re not cheap, either. Each cesta costs over $100. Players own several and must constantly repair and replace them from the wear and tear of play. The cestas put the real spin on the game-quite literally. 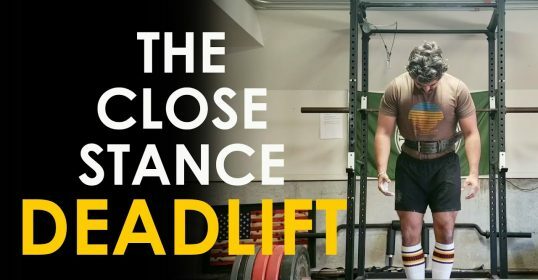 Throwing and catching a straight ball with them would be relatively easy, but players are able to put enormous spin on the balls which makes them less predictable and harder to hold onto. The red areas on the wall are foul areas. Balls that hit in this area are no longer playable. 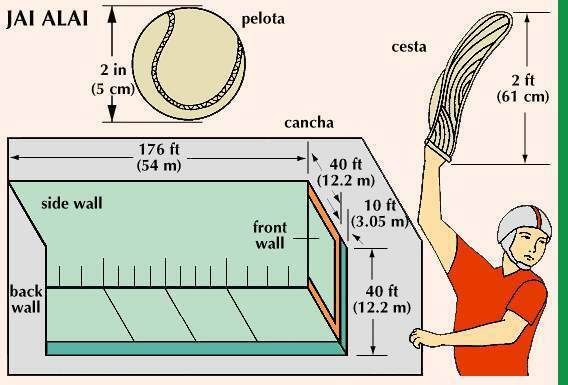 The foul area is made out of a different material than the rest of the wall and makes a distinct sound when hit, which allows players, referees, and spectators to immediately recognize a foul ball. The cancha. Jai alai is played in a large three walled court (front wall, left wall, and back wall) called the cancha. There is no standard size for a cancha, but the court is typically about 176 feet long (double the size of a basketball court) and 40 feet wide. Spectators sit on the open right side to watch the game and are protected from stray balls by a screen. Because all canchas have a wall on the players’ left side, all jai alai players must wear their cestas on their right hand. So lefties are out of luck. Running down the right side of the court is a 10-15 feet wide wooden out-of-bounds area called the contracancha. A ball cannot hit in this area, but a player can stand or run in it to save a ball. 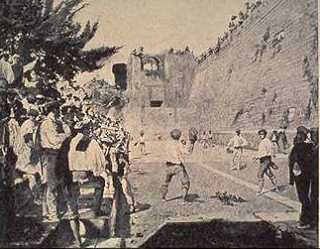 The front wall is made of granite because it’s the only material strong enough to withstand the pelota’s impact. Fourteen parallel lines divide the cancha horizontally across the court. Line 1 is the closest to the front and line 14 is the furthest away. Scoring. Scoring in jai alai is very similar to racquetball. Each point starts off with a serve. The server must bounce the ball behind the serving line (#11) and then hurl it towards the front wall. The ball must bounce between lines 4 and 7 after it hits the front wall. Teams then alternate catching the pelota in their cesta and throwing it in one fluid motion without holding and juggling it. The game’s judges determine whether a player catches and throws the ball in one fluid motion. Players must catch the ball on the fly or after it bounces once on the floor. 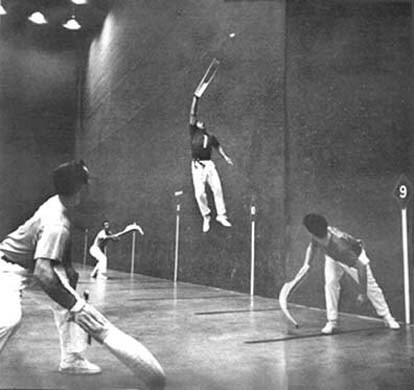 Jai alai games are played in a round robin format, usually with eight teams of two players each (with one front court and one back court player) or single players. Each team gets a number; this is the “post number” that appears on the front of their shirts. Team 1 takes on Team 2 and the winner of that games faces Team 3. The team that scores a point remains on the cancha while the losing team goes to the end of the line to await another turn on the court. Points usually double after the first round. The first team to score 7 or 9 points wins the game. Just like in horse racing, the next highest score is awarded “place,” and third place is awarded “show.” Playoffs are used in case of a tie. Betting on jai alai is just like betting on horse racing or dog racing. So you can place a single “win,” “place,” or “show” bet on a particular team or you can pick two teams to finish first and second with a “quinella” bet. Spectators can also make trifecta and superfecta bets. The skill and agility of the players allows for some handicapping but the speed and tricky action of the pelota introduces an element of luck into the equation.